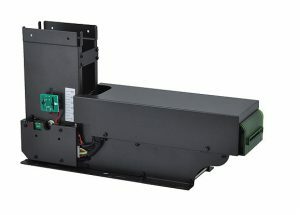 MTK-F61 is the featured magnetic card dispenser designed for magnetic card dispensing and decoding. It’s also available for reading/writing of ISO 7816 contact IC and ISO 14443 RF cards with optional modules. MTK-F61 is the featured magnetic card dispensers solution in various applications. It removes the complicated and costly magnetic writing module for cost control and compactness. If you need dispensers with magnetic encoding function, You can refer to MTK-X91 all-function card dispenser. Notes: All current provided models are MTK-F62 equipped with electrical shutter for anti vandalism and dust prevention. MTK-F62 will replace F61 for future shipments without price adjustment.